Empathy, or the ability to understand and relate to the experiences and feelings of another, has been touted as an important construct in the development of children’s prosocial behavior. The ability to empathize is strongly connected to the formation and maintenance of relationships; it is also frequently identified as a key factor in the determination of success in medical, educational, and other career fields. Research has suggested that many children and adolescents with autism spectrum disorders (ASD) struggle to successfully interpret the emotional states of others (Mazza et al., 2014). Other studies have indicated that children who demonstrate empathic deficits are more likely to engage in bullying (Stavrinides, Georgiou, & Theofanous, 2010). In response to these and other findings, educators and therapists have recognized the need for intervention strategies to foster empathy as an ability or skill. However, the game may also be enjoyed by adults and families. The rules of the game are relatively simple, but will both promote the game's serious goals and help players to be successful in the game. The acting tips on each card, for example, enforce specific rules about how emotions can be enacted (using facial expressions, hands, shoulders, etc.). There are two core mechanics in this game: acting and guessing. Each mechanic relies upon the player’s knowledge of different emotions. The acting mechanic encourages the player to a) recognize the emotion listed on the card, b) pull from their own relevant past experiences, and what they have seen others do when experiencing that emotion and c) successfully enact that behavior with some help from the acting tips listed on the card. The guessing mechanic requires the player to recognize the emotion as it is being displayed through facial expressions, body language, and other clues. Player interactions play a key role in the game, since the two core mechanics require that players pay close attention in order to recognize and guess emotions correctly. Players who know each other well may (or may not) be better able to recognize each others' emotional states -- in fact, this may be a clue not only to the depth of their relationship, but also to how well they listen, watch, and pay attention! Many players may come to the game hoping to develop their empathy skills. 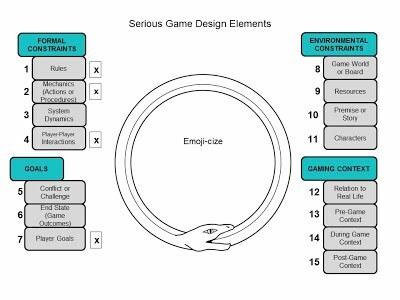 Additionally, the in-game goals of players (to earn as many emotion chips as possible by correctly guessing enacted emotions) are in line with the serious goals of the game. Many people -- including those with autism spectrum disorders (ASD) struggle to interpret the emotional states of others (Mazza et al., 2014). Studies have shown that children who participate in explicit training and practice in emotional intelligence skills demonstrate less anxiety and aggression; further, evidence suggests that prosocial behavior in childhood may predict academic success and mental health in later life (Kris, 2015). Research on emotional intelligence suggests that naming emotions can help children to strengthen their self-understanding and build their emotional vocabulary. "Reading" pictures and media and making connections with emotional states (such as the emoticons used in the game) can also help children to gain empathy skills. Practicing mindfulness -- operationalized in the game through the use of the 10 second empathy break -- can also promote emotional literacy (Kris, 2015). This game places value on the importance of empathy -- which is operationalized as the ability to recognize, interpret, and react appropriately to the emotional state of another person. The game values, and draws upon, self-awareness. To be successful, players must be able to call upon relevant experiences and will develop a better understanding of what different emotions feel like. Emoji-cize also values listening and observational skills. To effectively recognize and interpret another person's emotional state, a player must play close attention and observe the other person's facial expression and body language. Part of the fun of Emoji-cize is in the humor players find in incorrect answers. Playtesting revealed that even players that know each other well can completely misread each other's emotions. The game is also challenging, in that some emotions are more difficult than others -- both to guess, and to enact. What's more, different emotions may be harder or easier depending on the player. Therefore, the game strikes a balance between easier and more challenging rounds, keeping things fun and interesting. As one playtester noted, "I stretched emotionally and laughed a lot!" Empathy is the ability to understand and relate to the experiences and feelings of another. As such, it has been touted as an important construct in the development of children’s prosocial behavior. Empathy and related social skills are strongly connected to the formation and maintenance of relationships; they are also identified as important elements in the determination of success in many career fields. Research suggests that many children and adolescents with autism spectrum disorders (ASD) struggle to successfully interpret the emotional states of others (Mazza et al., 2014). Other studies have indicated that children who demonstrate empathic deficits are more likely to engage in bullying (Stavrinides, Georgiou, & Theofanous, 2010). In light of such research, educators and therapists have recognized the need for intervention strategies to foster empathy as an ability or skill. Children who participate in explicit training for emotional intelligence tend to exhibit less anxiety and aggression (Kris, 2015). Emotional intelligence research indicates that naming emotions can promote greater self-understanding and improve children's emotional vocabulary; that making connections between media/pictures and emotional states (such as the emoticons used in the game) can help children develop empathy; and finally, that practicing mindfulness -- operationalized in the game through the use of the 10 second empathy break -- can promote emotional literacy (Kris, 2015). Intrinsic motivation is an important factor in effective game-based learning. Ideally, this game will be intrinsically motivating because its learning outcomes are aligned with player goals and seamlessly integrated into gameplay instead of being pasted on as an afterthought. The game also employs extrinsic motivation in the sense that desired behaviors and mindsets -- namely, the recognition of emotions, increased empathy, and greater self-awareness -- are encouraged by external rewards (emotion chips and success in the game). Observing the behavior of others is an important aspect of developing empathy, and likewise, critical to success in the game. By observing the behaviors, tone of voice, and facial expression of other players -- both as they try to guess emotions and in watching more successful players -- learners will ideally be more likely to develop empathy skills. Kris, D.F. (2015). The Benefits of Helping Preschoolers Understand and Discuss Their Emotions. KQED News: Mindshift. Retrieved from http://ww2.kqed.org/mindshift/2015/04/13/the-benefits-of-helping-preschoolers-understand-and-discuss-their-emotions/. Mazza, M., Pino, M. C., Mariano, M., Tempesta, D., Ferrara, M., De Berardis, D., … Valenti, M. (2014). Affective and cognitive empathy in adolescents with autism spectrum disorder. Frontiers in Human Neuroscience, 8, 791. Stavrinides, P., Georgiou, S., & Theofanous, V. (2010). Bullying and empathy: A short-term longitudinal investigation. Educational Psychology, 30, 793-802.